Neil in his first blog post since the launch of Rush’s Clockwork Angels tour talks admirably about a book he’s been reading by Harvard cognitive scientist Steven Pinker, called The Better Angels of Our Nature, who pieces together an argument that people are becoming less violent, notwithstanding what it might seem like at times. What’s interesting, in Neil’s observation, is what’s not on the list of reasons for the decline: religion. Education, democracy, reason—these are the cultural developments that have led us to find ways other than violence to resolve conflict. Faith, by contrast, seems to do the opposite, particularly when those professing faith harbor doubts about their faith that they don’t want to confront. Neil says he doesn’t think about religion that much despite charges that he’s a faith basher. It’s only when faith gets pushed to the front, as it does so much in the South and Midwest, which he calls a “walled fortress” of faith, that he feels compelled to comment on it. All these “church signs and billboards,” he says, “all shouting at me, assaulting me, with breathtaking arrogance and ignorance . . . can be funny at first, but soon becomes appalling—such a backwards drag on the country, and the world. “I only report it, I do not comment,” he adds, channeling Paul Theroux. Fracking also gets his attention. While riding through North Dakota, a beautiful state that on previous tours was notable mostly for the abandoned barns that dotted the countryside, he sees everything now is topsy-turvy as energy companies trip over themselves to ramp up oil shale extraction using their new technology. Like everything in life, the fracking surge is good and bad—good for growing the economy but bad for the long-term impacts it’s having on the environment and a way of life. The problem isn’t with growth per se, he suggests, but with the pace of growth. It doesn’t appear anyone is taking the long view. The result is hasty, ill-conceived road and other building projects that don’t have sustainability or quality of life in mind. Religion, fracking . . . it seems like the post is just a downer, but actually it’s mostly upbeat. He ends with his thoughts on the tour and how energizing it’s been to have the string musicians on stage with the band this time around. The musicians were brought on board to provide accompaniment on the Clockwork Angels part of the show, but they’re also playing on other pieces, including “YYZ,” which Neil says wasn’t planned but is now one of his favorite parts of the show. The tour takes the band to Philadelphia today (Oct. 12) and to hometown Toronto this weekend. Read Neil’s post. Neil has updated his blog, News, Weather, and Sports, to fill us in on how the tour is going and we learn that he and his riding partner, Michael Mosbach, spent the end of October dodging Frankenstorm, or, as he likes to call it, Frankenstürm, which adds a little more heavy metal menace to it. Even when they were far west of the Atlantic seaboard and heading toward West Virginia, Frankenstürm was a menacing presence. Their plan was to ride through the higher elevations of West Virginia to get to their Oct. 30 show in Charlotte but major snow was threatened for just when they would be hitting the upper elevations, so they re-routed through the backroads of Kentucky and Knoxville and got through just fine. As it turns out, West Virginia got hit with four feet of snow. That particular tweet has a specific reference: a bad case of tendinitis in Neil’s left arm, lateral epicondylitis. Neil says he’s had this before, during the Test for Echo tour, but it was in the other arm. Given how easy it is on Twitter to say something you regret, especially after a glass of the Macallan, Neil says he and Michael have devised a rule, called the Atatürk Rule, to keep them from tweeting anything they’ll come to regret later. It’s named for the Turkish ruler Mustafa Kemal “Atatürk” (meaning “father of the Turks”) during the 1920s and ’30s. I’m not familiar with Atatürk myself, but Neil says he was quite an enlightened ruler but he also liked to drink, and often when he would drink too much he would blurt out some outrageous rule or command that he would never do while sober. Fortunately. he had some wise aides who who would hold off executing his command until they verified, the next day, that he really intended to go forward with it. Invariably he would not, and so he had the good sense of his aides to thank for keeping watch over him. Although Neil didn’t say this, there are plenty of people in the public eye who would benefit from employing the Atatürk Rule themselves (read: Rep. Anthony Weiner, as one example), although without a doubt the news would be lot more boring if every politician and celebrity did that. So, I guess we should be thankful not everyone is so disciplined. It has to be said that this was an anxious election for those of us who worry about true individual rights (key question, perhaps: “Does a woman own her body?”), compassionate government, and the separation of church and state. On a happier note, Neil says the band and the string musicians touring with them are really clicking. On Halloween, they were in Atlanta and the two female string players, Adele Stein on cello and Audrey Solomon on violin, gave everyne a big laugh by coming out wearing “wildly elaborate face makeup that night, from David Bowie’s Aladdin Sane to rhinestone arabesques.” (See image at the top of this post and at right.) Neil didn’t include pictures in his piece but I took a small screen grab of Audrey Solomon’s makeup from the excellent—in fact, incredible—photography on John Patuto’s site Cygnus-x1. The photography is credited to Kevin Millette and Rob Geller and if you haven’t checked it out yet, I recommend it. It’s terrifc, and it looks like photography from each stop on the tour is being captured and uploaded to John’s site. With the North American leg of Rush’s Clockwork Angels tour wrapped up (the last show was in Houston Dec. 2), Neil has updated his blog with a recap of his motorcycling adventures between Oregon and Texas, which includes a tension-filled two hours on a remote and sandy road in Arizona. Neil and his riding partner, Michael Mosbach, went down more than a few times as they navigated a dirt road coated with inches of loose sand and silt while on the way to Phoenix. Locals had suggested the road was passable by motorcycle, but, as Neil says, they either didn’t really know or couldn’t appreciate how much harder the road would be on motorcycle. It was only with the help of a small group of off-roaders that they were able to make their way back to solid ground. To show his appreciation for their help, Neil broke his rule of staying incognito and offered them tickets to the upcoming Phoenix show. Neil also revisits the fracking issue, which he talked about when the band was in the midwest earlier this year. As he had seen in the western part of North Dakota, with remote areas suddenly turned topsy-turvy by profit-hungry energy companies, the fracking boom had come to West Texas and now one of his favorite riding areas was being turned upside down in exactly the same way. The Clockwork Angels tour will be on hiatus until the spring, when it starts up again in Europe with a May 22 date in Manchester, England. (The North American leg had begun with a Sept. 7 date in Manchester, N.J.) The European tour is scheduled to end June 10 in Helsinki. 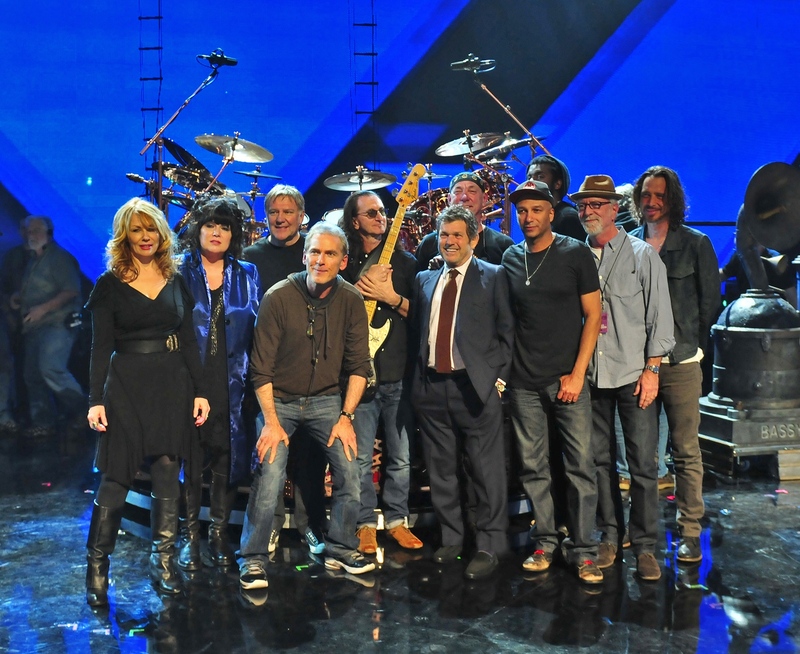 After the Dec. 2 Houston show, Neil stayed at the arena for the one and only time during the tour to celebrate the show with Alex and Geddy and the string musicians. I “raised a glass to my bandmates—–all ten of them!” he says. “Geddy proposed a toast to the stringers, and said that not only did we love their contributions musically, and the energy they brought to their performance, but they were fun to hang out with, too. “After thirty-five shows, and 13,632 motorcycle miles, we finished the Houston show on a very high note.” Read “Adventures in the Wild West” in its entirety. Neil Peart writes like a true fan of postmodern fiction, and of course he’s built not a small number of Rush songs on a postmodern infrastructure. Think “The Camera Eye” in Moving Pictures and a good number of songs on the band’s 1985 Power Windows album. “The Big Money” and “Grand Designs” both borrow from John Dos Passos, as does “The Camera Eye,” and “Bravado” from Roll the Bones borrows from John Barth, who certainly appears to be one of Neil’s favorite writers, based on his admiring comments about his writing. Postmodernism means different things to different people but a common marker for all of it is reader participation. As the reader, you have to really be engaged and stay with the writer to do the work justice, otherwise it’s just hard to get your arms around. But for the reader who persists, the rewards can be great. In the first update in quite some time to Bubba’s Book Club, his collection of book reviews, Neil pulls off a remarkable stunt and reviews not one book or two books but 21 books, all of which he’s read over the past year or so, including one from postmodern titan John Barth and one from a personal favorite of mine, Dave Eggers. He threw in John Irving’s latest novel as well, and unlike many casual readers who look at an Irving novel and go, “Oh, no, not another New England prep school with wrestling!” Neil seems to appreciate Irving’s mastery of these recurring motifs, which he uses as a base to explore whatever his latest subject is. Among the other authors Neil tackles: Michael Chabon, Michael Ondaatje, Barbara Kingsolver, Paul Theroux, and Douglas Coupland. So, how do you organize a review of 21 books all at once? Well, as it happens, all of the books (19 novels and two nonfiction works) were released in the last dozen years or so and they’re all by living authors, some quite young (meaning anyone under, say, 50). As a collection they give any lover of good writing a reason to breathe a sigh of relief that the digital era hasn’t put a fatal stake in the heart of literature yet, although, as Douglas Coupland says in a quote that Neil shares, “I kind of miss my pre-Internet mind.” We might all miss our pre-Internet mind, but at least writers are still able to produce great work. Whether we still have the patience to stick with them—that’s another matter. In any case, Neil tackles the authors alphabetically, starting with Barth and ending with Carlos Ruis Zafón, whose book, The Shadow of the Wind, is a Foucault’s Pendulum-type mystery that exploded onto the literary scene in 2001. In Neil’s view, all of the books are excellent. As he points out, since he’s doing this only for the enjoyment of it, he chose only the books he loved, so if you’re looking for a recommendation for a book to read, you can pick any of the 21 and know that at least one other person thoroughly enjoyed it. But don’t look to Neil’s reviews for a summary of the plot; he’s good at whetting your appetite without spoiling anything about the story. Note: In Barth’s novel Every Third Thought, the title refers to what people think about after the turn a certain age, and it’s death. Before they reach that age, it’s about the process that leads to creating that other thing that’s the opposite of death. If you like good writing, maybe every third thought is about writing. Probably not, but it’s better than thinking about death! Access his Book Club essay directly. Book reviews from Rush Vault. On break from the Clockwork Angels tour, Neil has been doing a lot of writing. A couple of weeks ago he posted a review of 21 books he had read over the past year or so and yesterday he posted an essay on what you might call “Thoughts Thunk in a Stately Fashion.” These are the thoughts we have when we’re outside, walking or hiking or, in his case, cross-country skiing in the Southern Laurentians, where he has property. Of course, it helps to have a warming fire and glass of whiskey to return to after your exertions to help you collect and record your thoughts. One of Neil’s qualites as a writer is the way he makes space for you, as a reader, to tag along with him while he gathers up and shares his observations. You certainly find that quality in the lyrics to Rush’s songs, and that might be one of the ingredients to the band’s success over the years, one of the qualities of their music that make it age well. In any case, Neil splits his essay into two perspectves, the first from a solitary retreat at his Southern Laurentian property, where the mercury drops to -18 Celsius and some of the most compelling stories are to be found not on the TV but outside, in the tracks left by a fox, or the signs that a moose spent the night in the shelter of evergreens. The second perspective is from another wnter retreat, this one near his home in Southern California, where he gets in a few hikes to places you would never know could be found right there in the Los Angeles metro area, including the Upper Las Virgenes Open Space Preserve. From both perspectives, he shares his thoughts on what he calls “trailcraft” (much like his “roadcraft” idea he says he wants to work into a book). It’s all about rules for living, and he manages to find a way to quote with approval rules for living from both Jack London and Ernest Hemingway, even though they’re taking what amounts to completely opposite positions. Jack London says, “I shall not waste my days trying to prolong them. I shall use my time,” and indeed London was dead by the time he was 40 after an event-filled life. Ernest Hemingway says, “First, one must last”—that is, live long enough to see your dreams fulfilled. And Hemingway lived to a much more ripe old age, 61, although in the end he shoots himself. (If Hemingway’s theme about the need to last over time sounds familiar, it’s because it’s the basis of Rush’s song “Marathon,” on Power Windows, from 1985. In a way that’s worth pondering, Neil manages to live by both sets of rules, judging by what he says in his writings, and I guess that’s what the ideas of “trailcraft” and “roadcraft” are all about: get out there and live—go on that hike, ski up and down that mountain—but do it in a way that’s tactically smart so you can endure long enough to see your dreams fulfilled.
. . . and write about them, you might add. Its always enjoyable reading Neil’s essays, and this one is no exception. Read “Winter Latitudes” here. When riding through Wales, Scotland, and other parts of Britain earlier this year for the European leg of Rush’s Clockwork Angels tour, which ended earlier this month, Neil and riding partner Brutus had to ride through miles of little twisty roads that had improbable switchbacks, boring scenery of upland pastures, thickets, and fells, typically terminating at a picturesque inn. After enduring weeks of that, Neil, in an essay he wrote for a British motorcycling weekly, says all other motorcyclists should avoid rural Britain at all costs. Neil wrote the essay, with its tongue-in-cheek ending, back in May and a version of it was published in the British motorcycling weekly. Neil yesterday posted the original version on his blog along with photos. “I decided to present [the piece] here in its original form, which would also fill a gap in the tour’s documentation”—that is, in the monthly installments Neil had been writing throughout the Clockwork Angels tour for his blog. The piece talks about the challenging riding and the scenery of rural Britain and how he and Brutus plan their “commute” on work days and their “slow touring” on days off. —And definitely something other motorcyclists shouldn’t try unless they’re prepared for relaxing, serene, and technically demanding riding through beautiful countryside. Read “Drummer With a Singletrack Mind” in its entirety on Neil’s site. When life throws you curves, you readjust, maybe go to Plan B—unless you’re on your motorcycle. Neil writes in his latest essay, called “The Sweet Science,” which he posted to his blog yesterday, that for a motorcyclist, curves are what it’s all about, and his latest discovery is North Carolina, where he found curves galore, often with little other traffic on them. He even found an out-of-the-way North Carolina byway in which his riding partner Michael Mosbach was able to capture him riding on a spot of road in which five curves were visible within the picture frame. A real gem. This “North Carolina byway made our highest score so far—five curves in one shot. It will be hard to beat,” Neil says. The theme of Neil’s essay is sweet science—that is, the satisfaction of studying and practicing something to master it enough that you can adjust appropriately when things don’t go right. Motorcycling, botany, and of course drumming: these are all sweet sciences. But the theme of his essay could also be about curves: the good curves, like those in North Carolina, that make for excellent motorcycling, and the challenging curves, like the one Jann Wenner threw him when the band was practicing for the closing performance of “Crossroads” at the Rock & Roll Hall of Fame induction banquet. At the rehearsal the night before the banquet, Neil says, he had laid down a tempo for “Crossroads” based on the way Rush plays the song on its 2004 all-covers Feedback album. “I was playing it the way we had recorded it, modeled on Cream’s version,” he says. But then a “rumpled-looking guy in a suit and tie” came up to him and said the tempo was too fast. As it turned out, the end-of-show jam went great. “We laid it DOWN,” Neil says, and, indeed, that’s what the sweet science is all about: achieving excellence no matter what curves are thrown your way. Of their speeches, Neil says they were planning to keep them short and improvised, just long enough to recognize their families, fans, and the business people who make it all happen, But at the last moment—another curve—they were told they had to fill a five-minute slot to give Taylor Hawkins and Dave Grohl of the Foo Fighters, who inducted them, time to get into their kimonos for the spoof on Rush’s ’70s style. Five minutes is a long time to fill, but we know how the band ended up doing it: Neil recognized their families and Geddy recognized their fans. But most of the five minutes was filled up by Alex saying nothing at all: his infamous “Blah” speech. But that’s what the sweet sciences are all about: handling curves without warning. Read Neil’s essay in its entirety. Neil’s ride through Poland and the former East Germany for the last part of Rush’s European Clockwork Angels tour this month became a trip down memory lane as he returned to some of the points he was trying to make in “Heresy” in Roll the Bones, released in 1991, and “Red Sector A” in Grace Under Pressure, released in 1984. In this latest writing on the topic, he applies the same thoughts about forgiving and forgetting to the holy warriors and fundamentalists who are wreaking so much havoc on civil society today. “Someday, I trust, the same will be said about religion,” he says. He doesn’t make the connection, but that’s pretty clearly what “Wish Then Well” on Clockwork Angels is all about: moving on rather than trying to exact punishment on someone who so obviously deserves it. And since Clockwork Angels can be interpreted in large part as a critique of religion (it channels Voltaire’s criticism of Leibniz’s “best of all worlds” Christianity), presumably it’s religious fanatics at least in part that we’re supposed to wish well. In Poland, he reiterates points he’s made in the past about how “Red Sector A” looks at the idea of how people liberated from the death camps believe, as a kind of coping mechanism, they’re the last people left alive because they can’t believe civilized society would allow them to be treated so inhumanely by others. But he also fills in a blank about what he means by the line “For my father and my brother, it’s too late / But I must help my mother stand up straight.” It refers to how the inmates would hold up the sick and the feeble lest they get plucked out of the camp by guards and gassed because they’re too weak to work. It’s interesting that Grace Under Pressure came out in 1984, the title year of George Orwell’s masterpiece about totalitarianism, and of course critiquing authoritarianism, whether secular or religious, is what much of the album is about. That Neil: he is a clever guy. In any case, the blog post is far from all gloom and doom, and indeed, upon finishing the European leg of the tour, he mentions how Brutus, his good friend and riding partner, was riding for the first time since being treated for cancer. And how to write about it. Neil’s post makes great reading, as his writing always does. Access “Shunpikers in the Shadowlands” now. When the remixed album comes out, that will certainly be a good ending to the Vapor Trails story. The band has never been happy with the production on the album, so getting a new and improved version out there will certainly be a good way to give that tale a happy ending. Neil in his latest blog post says the vibe after the band’s last Clockwork Angels show, in Kansas City August 4, was quite a bit different than on previous tours because for the band members and crew, the last show never feels like a farewell; there’s always the expectation they’ll get together again when the next tour starts. But for the seven string musicians who’ve been Rush’s touring companions for the last 18 months it really was goodbye. The CD and festivities capped off a long tour, one that included a lot of difficult moments, including during the Red Deer benefit concert, which the band played just a few weeks earlier, on July 24. Rush held the Red Deer concert as a way to raise relief funds for flood ravaged parts of Canada and it turned out to be a smashing success, with more than $500,000 raised, much of that going to Calgary, where Rush had to cancel its show because of water damage to the arena. But the Red Deer show brought its own near-disaster, because the band had to play the first half without its crucial stage monitors. Actually, if you want to hear a recording of it, Rush in the video below is playing “Territories” during the first half of their show that night. In much of the rest of his post, Neil talks about his adventures motorcycling from show to show for this last part of the tour, much of it in the Mountain West part of the United States—Washington, Oregon, Montana, Wyoming, and Idaho. It’s great motorcycling country, with wide open expanses and scenic mountain ranges, but unfortunately a big swath of Washington was marred by what came to be called the Colockum Tarps fire. Neil and his road companions put in several big-mileage days, racing from one national park to another, at one point riding 1,000 miles in just two days. And for the second time this tour, he had to ride part of the way with a nail-damaged tire. The problem got so bad that he had to switch motorcycles with Chris Stankee, his riding companion from Sabian, the cymbal company, so he could go on ahead and get to that day’s show. It sounds like there were plenty of nails in the road during Rush’s Clockwork Angels tour, but like the protagonist of Clockwork Angels, Owen Hardy, the nails were dealt with as needed and the tour, in the end, was a success. Read Neil’s post in its entirety. ~ by rvkeeper on August 24, 2013.